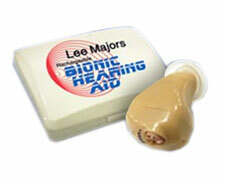 Now you can hear what you’ve been missing with the Lee Major’s Rechargeable Bionic Hearing Aid. It combines digital hearing aid technology with the ultra convenience of a rechargeable battery. Now you can enjoy noticeable, digital quality hearing improvement without the hassles of traditional battery operated hearing aids. The advance bionics technology helps assist normal human hearing functions, letting you enjoy hassle-free hearing. With the Lee Majors Rechargeable Bionic Hearing Aid, you can enjoy watching TV, listening to music, and more, at a comfortable level for those around you. Currently there is a risk-free 30 day trial offer of the Bionic Hearing Aid available. You can try for first for $14.95 plus the cost of shipping and handling. After 30 days it is only 3 installment payments of $99.95. One Comment on "Bionic Hearing Aid"
Thank you for your post! It is very helpful to people exploring different hearing aid devices.Not many hearing aid devices combine digital hearing aid technology with the convenience of a rechargeable battery.